The three triads can be compared to a ladder which the monad climbs on the first stage of its evolutionary journey from plane 1–7. This ladder is mentioned in the Bible in Genesis 28:12: “[Jacob] had a dream in which he saw a ladder resting on the earth, with its top reaching to heaven, and the angels of God were ascending and descending on it”. The mineral, plant, animal and human kingdoms all operate through the first triad. Our etheric bodies were first acquired when our monads passed through the mineral kingdom, and were built up in the plant kingdom. Our emotional bodies were first acquired when we passed through the plant kingdom, and were built up in the animal kingdom. Our mental bodies (minds) were first acquired when we passed through the animal kingdom, and are being built up now in the human kingdom. In the human kingdom we also have to refine these three subtle bodies and build up our next body, the causal body, so that we can bridge the gap between the first and second triads. Because each one is more subtle than the previous, the bodies easily inter-penetrate each other. The etheric body is the energy template around which the physical body is formed. Consequently, it is exactly the same size and shape as the physical body, but with an aura that projects slightly beyond the skin. The emotional body also has a counterpart that corresponds with the physical body. Around 99% of the matter in the emotional body is contained “within” the emotional counterpart to physical body, and the remainder forms an ovoid aura which projects about 2 feet (60cm) from the body. The same is true of both the mental and lesser causal bodies, with 99% of the matter “within” the physical body and the remaining 1% forming an aura. The size of the human aura is determined by the size of the lesser causal body. It is an ovoid shape which typically extends 2–3 feet (60–90cm) from the body and acts as a kind of protective shell. There are some very good illustrations of man’s subtle bodies in Barbara Brennan’s book Hands of Light, although she has devised her own names for them. Consciousness cannot function directly through the physical body, which is little more than a garment that enables us to function in a physical environment. The physical body must be controlled via the etheric body; without it the physical body is unconscious and immobile. The physical and etheric bodies are therefore two halves of a whole, known as the physical-etheric body, which are only completely separated at physical death. 5:7), encloses the lower three just as our causal body encloses our personality. The lower three bodies of a second self are the causal body (3:5–3:7), the unity body (4:1–4:7) and the lower spiritual body (5:1–5:4). The combined consciousness of these subtle bodies is sometimes called the higher self, but the higher self of the average human is not fully developed and generally only includes the causal body. Even our causal body is not our own, but is on loan from our guardian angel. The guardian angel can therefore be considered our caretaker higher self until we enter the fifth kingdom and actually become our higher self. In the first triad the matter aspect is the most dominant – everything is focussed around life on the physical plane. In the second triad the consciousness aspect is the most dominant, but the consciousness of our second triad can only be subjectively perceived until a direct link has been built between the two triads. This is completed at enlightenment (the 3rd initiation), but it is not until the 4th initiation that we enter the fifth kingdom. At that moment the primary guardian angel is released, the borrowed causal body destroyed and the monad instantly creates its own. The individual self-identity developed in the human kingdom is retained in the fifth kingdom, but consciousness also expands to become part of a collective. The fifth kingdom is a group of “superhuman” beings that have already passed through the human kingdom. They no longer need to incarnate into physical human bodies but a few occasionally do so in order to teach humanity. When they do incarnate into human bodies they are invulnerable to any kind of disease. The fifth kingdom is known as the “Kingdom of God” because its members are omniscient on planes 1-4 and are the nearest thing to God that humans will ever know. Some of its members guide the evolution of humanity and implement the divine plan on Earth – they are known as the “planetary hierarchy”. In years gone by, larger numbers of the planetary hierarchy regularly incarnated to guide and teach humanity (they gave us esoterics). To the ancient humans they would have seemed liked gods, even though they are not. Around 12,000 years ago, humans mistakenly thought they could manage their own affairs and the planetary hierarchy were banished – we have been fighting amongst ourselves ever since. At the present time the planetary hierarchy conducts its business behind the scenes, on the etheric plane. They periodically release esoteric information to advanced disciples who will publish the information openly; there are no official “channels”, no secrets, no cults and no sects. Theosophists mistakenly call the third triad the monad. This mistake should be obvious because a monad can have only one part and a triad must have three. A further consequence of this error is that they incorrectly call the sixth plane the monadic plane. The third triad is composed of the spiritual atom (5:7), the divine atom (6:7) and the monadic molecule (7:4). A third self consists of four different bodies/beings. 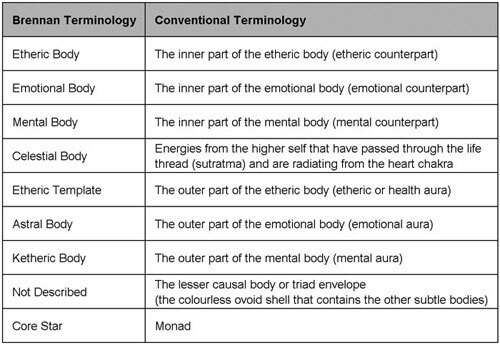 The highest, the upper monadic body (7:5-7), encloses the lower three just as our causal body encloses our personality. 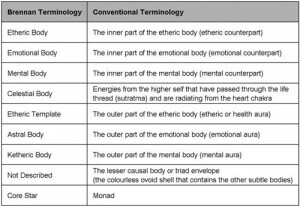 The lower three bodies of a third self are the upper spiritual body (5:5-7), the divine body (6:1-7) and the lower monadic body (7:1-4). The combined consciousness of these subtle bodies is sometimes called the “divine self”, but the divine self of a human being is completely undeveloped. In the first triad the matter aspect is dominant, in the second triad the consciousness aspect is dominant and in the third triad the energy aspect is dominant. Third selves have already mastered matter and consciousness and they now need to master energy. Since “Will = Consciousness + Energy”, the energy aspect is often called “will power”. They hold the senior posts of the planetary hierarchy and they use their will power to guide the evolution of the lower kingdoms. They know the future because they help to create it – everything that occurs on the physical plane has its origin in the subtle planes. Events are conceived and set up on the subtle planes long before they manifest on the physical plane. Third selves share the collective consciousness of the solar system whilst retaining their individual sense of identity and character. Once a monad achieves active consciousness on a specific plane, it shares the collective consciousness of all the lower planes and can therefore be said to be omniscient on those lower planes. A third self’s mastery over the energy aspect means he can also be said to be omnipotent on the lower planes. A monad (49-atom) is involved in a 7-atom for its entire journey through the solar system, but the journey does not stop there. Once a monad has fully awakened its consciousness in that 7-atom it can dispense with its three triads and continue its evolution beyond the solar system. The monad’s 7-atom contains all the forty two higher kinds of atoms, therefore a chain of atoms can be said to connect the monad with all the forty two higher planes of existence. This chain of atoms is the “ladder” which the monad will climb on the cosmic stage of its evolutionary journey. The monad passes through six cosmic kingdoms, which correspond to the upper six cosmic planes (8-14, 15-21, 22-28, 29-35, 36-42 and 43-49). When the monad has evolved all the way up to plane 49 it has come full circle and is once again a fully liberated 49-atom. It began its journey as an unconscious atom of primary matter and has evolved into a fully-realised quaternary monad whose field of consciousness embraces an entire galaxy. The final challenge that faces the monad is to leave the universe it “grew up” in and go off into the Infinite to create its own universe. The Gnostics used the term “Father” to denote the third self or spirit triad. So when Christ said “the father and I are one” (John 10:30), he meant he was united with his Spirit, or more accurately that his monad was centred in his third triad. The Gnostics used the term “Son” to denote the second self or soul triad. So when Christ said “no one knows the Father except the Son” (Matthew 11:27), he meant that we need to become second selves before we can even begin to comprehend what a third self is. The phrase: “No one comes to the Father except through me” (John 14:6) originally read “no one comes to the Father except through the Son”. Since humans are centred in our first selves, we must therefore pass through the Son (second self or soul triad) to get to the Father (third self or spirit triad). The Gnostics used the term “Mother” to denote the first self or Personality; the lowest aspect of our being that incarnates into the physical body. The word “mother” originates from the Latin “mater”, and it is no coincidence that the word “matter” shares the same root. The Mother (personality) gives birth to the Son (soul), and the son goes on to become the Father (spirit). Or as the bible puts it: “It is sown a soul body; it is raised a spiritual body” (1 Corinthians 15:44). The term “Mother” later became confused with the “Holy Spirit”. “Holy Spirit” actually refers to our own personal guardian angel who stands in for our soul and guides our development until our soul is fully activated. We each have our own guardian angel so there literally billions of them but they are united because they share a collective consciousness. Our guardian angel can be considered our personal Holy Spirit or our personal “god” because it guides us, inspires us, protects us, knows our every thought and hears our prayers. The Holy Spirit is very active amongst the born-again Christians. They “speak in tongues” when their guardian angel communicates with them on a super-conscious level and they are healed when their guardian angels send down higher energies. This often causes them to faint because their brains are not used to the higher energies.